The purpose of the study was micro-CT analysis to compare the effectiveness of ProTaper Universal Retreatment files, Reciproc, and Gates Glidden (GG) with H files, for retreatment of oval root canal of extracted human teeth that were obturated using gutta-percha/BCS. The research was approved by the Research Ethics Committee at Faculty of Dentistry, King Abdulaziz University (No. 006-16). Thirty extracted human single oval-rooted teeth were selected, with closed apex with neither caries, crack, nor fracture. Soft tissues and calculus were mechanically removed from the roots. Teeth were then immersed for 24 h in a 3% sodium hypochlorite (NaOCl) solution to eliminate remnants of soft tissues. All endodontic procedures were performed by a single operator. The access cavities were prepared. Size 15 K-type files (Dentsply Maillefer, Ballaigues, Switzerland) were inserted through canals 1 mm beyond the apical foramen to establish apical patency. The working length (WL) was established 1 mm shorter than the tooth length. The canals were instrumented with a size 20 hand file to the WL. The canals were prepared with three ProTaper Next Rotary Instruments (Dentsply Tulsa Dental Specialties, Tulsa, OK, USA) following the manufacturer's instructions (X1, X2, and X3). Instruments were cleaned after each use, being used for five canals before discarding. Five percent NaOCl was used as irrigating solution between each file. The irrigating solution was delivered with a 30-gauge Max-i-Probe needle (Dentsply-Rinn, Elgin, IL, USA) placed loosely 1 mm short of the WL. Five mL of 17% ethylenediaminetetraacetic acid (Sigma Lab Chem. Inc., Pittsburgh, PA, USA) for 1 min. Finally, the canals were irrigated with 5 mL of 5% NaOCl for 3 min, and then, the canals were dried with paper points. Matching gutta-percha cone fitted with tug-back. This master cone was covered with BCS (Dentsply De-Trey, Konstanz, Germany) which were mixed according to the manufacturer's instructions; then, gutta-percha was slowly inserted into the root canal till it reached WL. Cold lateral compaction with a size 25 finger spreader and size 20 accessory gutta-percha cones was performed until the spreader could not be introduced more than 2 mm into the root canal. The coronal gutta-percha was removed with a hot plugger; specimens were digitally radiographed to confirm the quality and length of the root canal filling. Access cavities were temporarily sealed with Cavit (ESPE, Seefeld, Germany), and the samples were stored for 7 days at 37°C and 100% humidity. Before the retreatment procedure, the samples were numbered and randomly distributed into three groups. Group 3: Retreatment was initiated using GG drills (Dentsply Maillefer) to remove gutta-percha from the coronal third; H files were used sequentially in crown-down technique to remove gutta-percha from middle and apical thirds. Final canal preparation was done using size 40 H file at WL. Radiographic examination was performed using micro-CT (SKY SCAN–1172/MICRO-CT, USA). Statistical analysis was then performed using a commercially available software program (SPSS 19; SPSS, Chicago, IL, USA). 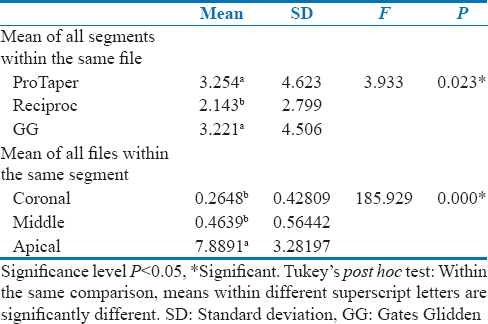 As data were parametric, significance of the difference between different root segments within the same file type and difference between files within each segment was compared using one-way ANOVA test and Tukey's post hoc test, respectively. Two-way ANOVA was used to study the effect of the interaction of file type and root segment variables. The level of significance was set at P < 0.05. 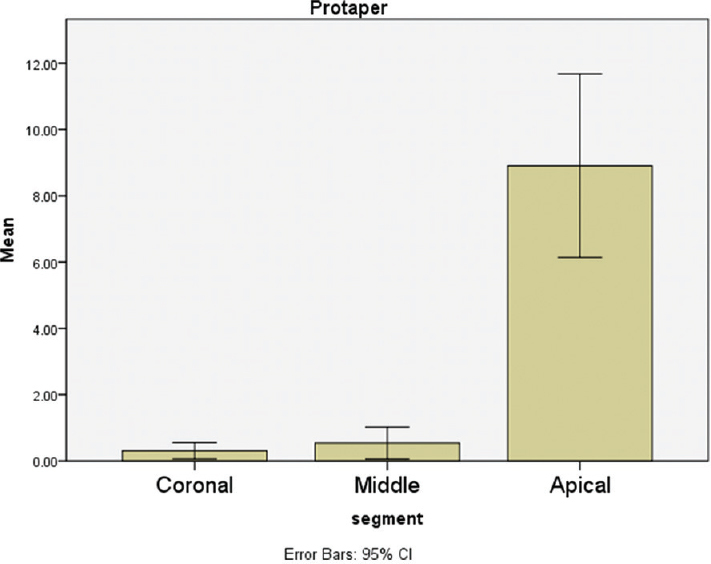 Using ProTaper file, the highest mean value was recorded in the apical segment. ANOVA test revealed that the mean value of the apical segment was extremely significantly higher than the coronal and middle segments (P = 0.00). Tukey's post hoc test revealed no significant difference between coronal and middle segments [Table 1] and [Figure 1]. 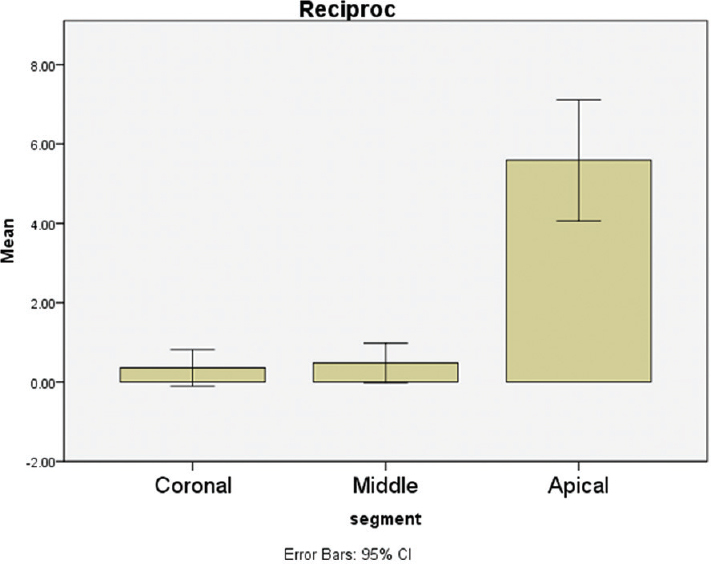 Using Reciproc file, the highest mean value was recorded in the apical segment. 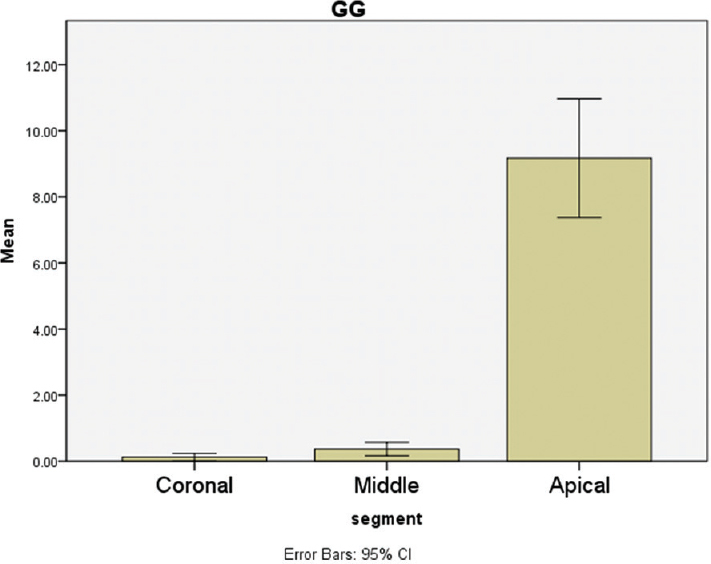 ANOVA test revealed that the mean value of the apical segment was extremely significantly higher than the coronal and middle segments (P = 0.00). Tukey's post hoc test revealed no significant difference between coronal and middle segments [Table 1] and [Figure 2]. Using GG file, the highest mean value was recorded in the apical segment. ANOVA test revealed that the mean value of the apical segment was extremely significantly higher than the coronal and middle segments (P = 0.00). 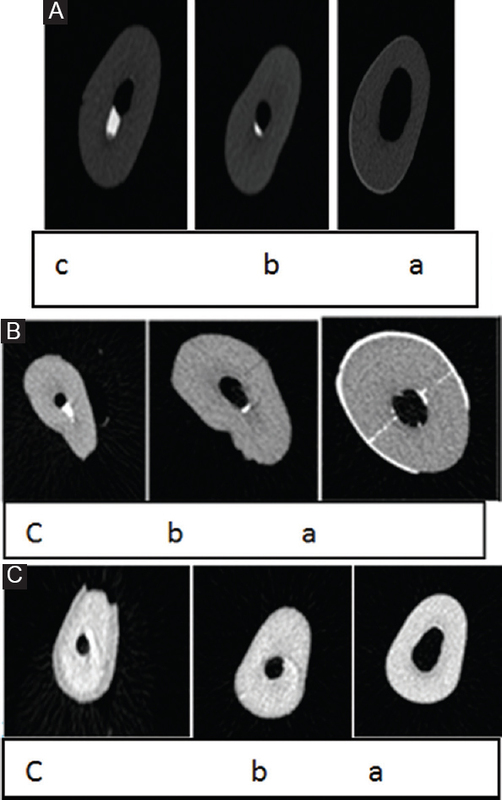 Tukey's post hoc test revealed no significant difference between coronal and middle segments [Table 1] and [Figure 3]. In the coronal segment, the highest mean value was recorded with Reciproc file, while the lowest mean value was recorded with GG file. ANOVA test revealed no statistically significant difference between different files (P = 0.447) [Table 2] and [Figure 4]. In the middle segment, the highest mean value was recorded with ProTaper file, while the lowest mean value was recorded with GG file. ANOVA test revealed no statistically significant difference between different files (P = 0.797) [Table 2] and [Figure 4]. In the apical segment, the highest mean value was recorded with GG file, while the lowest mean value was recorded with Reciproc file. ANOVA test revealed that GG and ProTaper files recorded a statistically significant higher mean value in comparison to Reciproc file (P = 0.019). Tukey's post hoc test revealed no significant difference between GG and ProTaper files [Table 2] and [Figure 4]. ProTaper and GG files showed a statistically higher mean value compared to Reciproc (P = 0.023). However, there was no significant difference between ProTaper and GG files. Apical segment showed a statistically higher mean value compared to coronal and middle segments (P = 0.000). However, there was no significant difference between coronal and middle segments. Two-way ANOVA test revealed that the interaction of root segments and file type variables caused a statistically significant difference (P = 0.002) [Table 3] and [Table 4]. Keeping the normal attachment apparatus around the naturally retained tooth is very important. Therefore, adequate endodontic treatment is the cornerstone to preserve natural teeth. This study was conducted on human extracted teeth with straight oval root canals, to evaluate the efficacy of specially designed NiTi rotary systems and manual hand files to remove gutta-percha/BCS root canal filling materials during retreatment. One operator conducted all the endodontic procedures, to achieve procedures that are more standard and to minimize the human variation. The cytotoxicity of solvents as chloroform or eucalyptol that used to dissolve gutta-percha in different retreatment technique was reported; in addition, these solvents cause residual layer of gutta-percha on the root canal walls that penetrate into the dentinal tubules and interfere with sealer penetration and adhesion. Hence, in this study, the protocol of using solvents was not followed. Wilcox et al. reported that the use of H files without solvent resulted in more effective cleanliness compared with hand instrumentation with solvent. Many techniques used to evaluate the root canal filling residue as vertical sectioning. Capar et al. used mandibular molars with straight roots and reported that four specimens were damaged in the sectioning technique. Radiograph technique is 2D, so radiographs do not detect all remaining filling material. In this study, brushing motion of the instrument was used for gutta-percha removal, to facilitate greater amount of filling material removal, even in more flattened areas. Rödig et al. reported that the percentage of residual material evaluated by micro-CT was 5.1%–8.3%, which was nearly similar to the results of our present study. 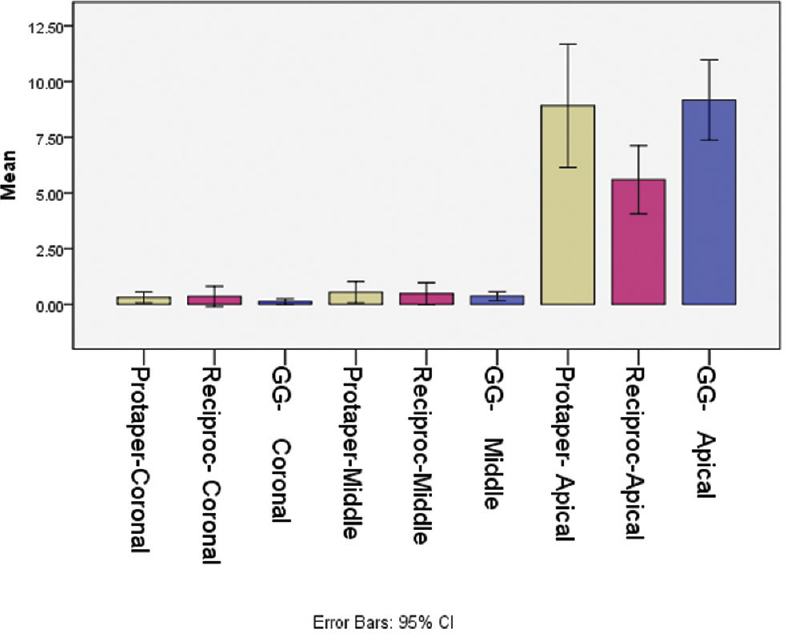 ProTaper and GG files showed more remnant of filling compared to Reciproc (P = 0.023). However, there was no significant difference between ProTaper and GG files. This was in accordance with Zuolo et al., who reported that files used in reciprocating motion were more effective than files used in continuous motion. On the other hand, Rios et al. and Martins et al. stated that reciprocating file systems are as effective as ProTaper retreatment system. Our results were in disagreement with Rödig et al., who stated that there was no significant difference between H files, ProTaper Universal Retreatment, and Reciproc. Apical segment showed more remnant of filling compared to coronal and middle segments (P = 0.000). However, there was no significant difference between coronal and middle segments; this might be attributed to the matching gutta-percha cones and the hardness of BC upon setting that might compromise retreatment of the apical canal space. These results were in accordance with Hess et al. Our results were contradicting to the results reported by Schirrmeister et al., who concluded that no significant differences between the root canal thirds when investigated using scanning electron microscope. These differences in results between different researches could be attributed to different study designs regarding root canal curvature and preparation technique. Micro-CT is an accurate nondestructive 3D analysis technique for visualizing the remnants of endodontic filling materials within the root canal system. Remnants of filling materials were observed in all samples regardless of the group examined; new techniques and solvent materials should be developed to be able to completely remove BCS. We would like to thank Prof. Dalia El Robi, Professor of Oral Pathology, Faculty of Oral and Dental Medicine, Cairo University, for her valuable assistance in the statistical analysis performed in this study. Bergenholtz G, Lekholm U, Milthon R, Heden G, Odesjö B, Engström B, et al. Retreatment of endodontic fillings. Scand J Dent Res 1979;87:217-24. Taintor JF, Ingle JI, Fahid A. Retreatment versus further treatment. Clin Prev Dent 1983;5:8-14. Friedman S, Rotstein I, Shar-Lev S. Bypassing gutta-percha root fillings with an automated device. J Endod 1989;15:432-7. Farge P, Nahas P, Bonin P. In vitro study of a Nd:YAP laser in endodontic retreatment. J Endod 1998;24:359-63. Zuolo AS, Mello JE Jr., Cunha RS, Zuolo ML, Bueno CE. Efficacy of reciprocating and rotary techniques for removing filling material during root canal retreatment. Int Endod J 2013;46:947-53. Rödig T, Kupis J, Konietschke F, Dullin C, Drebenstedt S, Hülsmann M, et al. Comparison of hand and rotary instrumentation for removing gutta-percha from previously treated curved root canals: A microcomputed tomography study. Int Endod J 2014;47:173-82. Fruchi Lde C, Ordinola-Zapata R, Cavenago BC, Hungaro Duarte MA, Bueno CE, De Martin AS, et al. Efficacy of reciprocating instruments for removing filling material in curved canals obturated with a single-cone technique: A micro-computed tomographic analysis. J Endod 2014;40:1000-4. Rios Mde A, Villela AM, Cunha RS, Velasco RC, De Martin AS, Kato AS, et al. Efficacy of 2 reciprocating systems compared with a rotary retreatment system for gutta-percha removal. J Endod 2014;40:543-6. Bernardes RA, Duarte MA, Vivan RR, Alcalde MP, Vasconcelos BC, Bramante CM, et al. Comparison of three retreatment techniques with ultrasonic activation in flattened canals using micro-computed tomography and scanning electron microscopy. Int Endod J 2016;49:890-7. Zmener O, Pameijer CH, Banegas G. Retreatment efficacy of hand versus automated instrumentation in oval-shaped root canals: An ex vivo study. Int Endod J 2006;39:521-6. Elayouti A, Chu AL, Kimionis I, Klein C, Weiger R, Löst C, et al. Efficacy of rotary instruments with greater taper in preparing oval root canals. Int Endod J 2008;41:1088-92. Alves FR, Almeida BM, Neves MA, Moreno JO, Rôças IN, Siqueira JF Jr., et al. Disinfecting oval-shaped root canals: Effectiveness of different supplementary approaches. J Endod 2011;37:496-501. Keleş A, Alcin H, Kamalak A, Versiani MA. Oval-shaped canal retreatment with self-adjusting file: A micro-computed tomography study. Clin Oral Investig 2014;18:1147-53. Roggendorf MJ, Legner M, Ebert J, Fillery E, Frankenberger R, Friedman S, et al. Micro-CT evaluation of residual material in canals filled with activ GP or guttaFlow following removal with Niti instruments. Int Endod J 2010;43:200-9. Solomonov M, Paqué F, Kaya S, Adigüzel O, Kfir A, Yiğit-Özer S, et al. Self-adjusting files in retreatment: A high-resolution micro-computed tomography study. J Endod 2012;38:1283-7. Martins MP, Duarte MA, Cavenago BC, Kato AS, da Silveira Bueno CE. Effectiveness of the ProTaper next and Reciproc systems in removing root canal filling material with sonic or ultrasonic irrigation: A micro-computed tomographic study. J Endod 2017;43:467-71. Taşdemir T, Yildirim T, Celik D. Comparative study of removal of current endodontic fillings. J Endod 2008;34:326-9. Wilcox LR, Swift ML. Endodontic retreatment in small and large curved canals. J Endod 1991;17:313-5. Paqué F, Peters OA. Micro-computed tomography evaluation of the preparation of long oval root canals in mandibular molars with the self-adjusting file. J Endod 2011;37:517-21. Beasley RT, Williamson AE, Justman BC, Qian F. Time required to remove guttacore, thermafil plus, and thermoplasticized gutta-percha from moderately curved root canals with ProTaper files. J Endod 2013;39:125-8. Vajrabhaya LO, Suwannawong SK, Kamolroongwarakul R, Pewklieng L. Cytotoxicity evaluation of gutta-percha solvents: Chloroform and GP-solvent (limonene). Oral Surg Oral Med Oral Pathol Oral Radiol Endod 2004;98:756-9. Capar ID, Arslan H, Ertas H, Gök T, Saygılı G. Effectiveness of ProTaper universal retreatment instruments used with rotary or reciprocating adaptive motion in the removal of root canal filling material. Int Endod J 2015;48:79-83. Nevares G, de Albuquerque DS, Freire LG, Romeiro K, Fogel HM, Dos Santos M, et al. Efficacy of ProTaper NEXT compared with Reciproc in removing obturation material from severely curved root canals: A micro-computed tomography study. J Endod 2016;42:803-8.